Avalofractus is a rangeomorph that lived attached to the seafloor by a bulb-like holdfast. Scientists have speculated that Avalofractus, like other rangeomorphs, may have been either an osmotroph (absorbing nutrients through its membranes from the water column), or a filter feeder (straining nutrients from the water column). 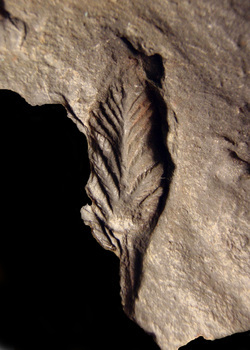 The branched frond is thought to have been elevated into the water column by a short stem. Avalofractus is unique amongst rangeomorphs in that you can see both sides of its branches at all orders. Only a handful of specimens are known, and it is amongst the rarest of all Ediacaran taxa. However, the few specimens we do have are preserved very three-dimensionally, and are some of the most beautiful of Ediacaran fossils. Rangeomorph frond showing at least three orders of self-similar, alternately pinnate, branching. All branches are rangeomorph elements that typically show both sides of the rangeomorph element. Individual branches that are pivoted or rotated relative to their neighbours are common. Ovate to elliptic petalodium attached to a slightly expanded basal holdfast by a long stem typically comprising 30-50% of the length of the frond.